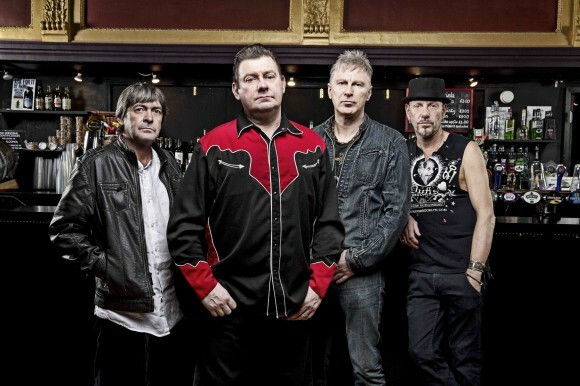 It’s been ten years since Irish punk legends Stiff Little Fingers have released a record, but in March the wait will finally be over. With the return of their original bass player and a Pledge Music drive to fund the record, this release can be seen as a return to form for the band, but their sound has undoubtedly matured. On the brink of a substantial tour, lead singer (and the only member who has stayed with the band since the beginning) Jake Burns took some time to speak with mxdwn about his feelings on the new record and state of the Stiff Little Fingers today. What have you all been up to since the last record? Jake Burns: Oh, blimey, where do I start? We’ve gone through a lot of changes, obviously the main one being Bruce [Foxton] leaving the band and Ali [McMordie] coming back, and that was just kind of a shock, because Bruce didn’t feel like touring as much as we wanted to, which is fine. And, I went through a lot of personal things in my life– I got divorced, had to move, I met somebody else and moved continents and got re-married. So, you know, basically life just got in the way, really; that’s why it’s kind of taken so long between records. What inspired you to put out a new one? It was just that time, you know? We’d taken so long that we just kind of had to do it. It’s what we do, and we had written the songs. I had kind of written a bunch of songs about 5 years ago that when I went back and looked at them, I didn’t think were really good enough. I kind of felt like I was writing a record because I had to and not because I wanted to– and that’s not something we’ve ever done, so I scrapped them all. Obviously, the band wasn’t that enamored, simply because they thought five years had already been too long to write a record, but I honestly felt that I was writing the same kinds of songs that I could have written when I was 20 years old and I recently just turned 50. And I kind of felt like I should take… not necessarily a more grown up approach to what I was doing, but a more measured approach and I felt like I could write better songs. So, I got rid of all of those, we kept little bits and pieces of some of them and then I set about writing a whole set of new songs. And I think we all feel that it was definitely worth waiting to do that, because its a better record than we would have done five years ago. It’s definitely a step forward from the last one. When we made the last one, the Guitar and Drum record, we actually probably got the best reviews since the first album and we got into the mindset where we wanted to go back to what we felt we did best, which was just being a four-piece band. In the interim we had experimented with keyboards and with horn players and it just kind of took away from what we feel we do best. I mean, it wasn’t just called Guitar and Drum by accident; we deliberately went back to if we didn’t play it or sing it, it didn’t go on the record. And we got not just very good press reviews on it, but actually the audience was telling us how much they enjoyed it, and that they thought it was kind of a return to form, I suppose. So we decided to just stick to that and do the same thing this time around, and that’s what we did. I feel the songs are better; a lot of thought went into them but we didn’t want to overthink it because that can lead to a pretty sterile record. It was an easy record once we actually got the songs written because it was just down to the four of us locking ourselves away in a studio for a few weeks and basically just singing and playing it again. It’s a logical continuation of the last one, only with a ten year gap. How do you think the band’s sound has evolved over the years? Well, obviously we play better– that’s just a consequence of having been doing it for so long. When you start as a writer you tend to use all the obvious chord changes, all the obvious modes, all the obvious midsections when you’re writing in any particular key, but when you start they all sound really exciting because they’re what make it sound like a real song to you. But further on, you become more and more aware of those things– and I can’t speak for any other writers, but from my point of view it was kind of like “Oh, really? I’m going to use F# minor there? Really? I do that all the time,” so there’s gotta be another direction I can take this rather than go to the obvious. So from my point of view, sort of as the main writer, I tried to mix it up a bit and throw in changes that would actually surprise the listener a bit, and I think it makes it a more interesting record because when you don’t expect those sort of things they do sort of keep your attention on them. Have you taken any influence from any current musical trends? Not really. I’m not sure if that’s a good thing or a bad thing. I think because we were consciously trying to go back to what we do best, I was listening to all the stuff that kind of influenced [us] in the early days, and in fact at one point I went through a long period of writer’s block and I guess I’d kind of become disenchanted with the whole thing. Like I said earlier, I felt like I was writing a record because I had to and not because I wanted to and that just felt wrong to me, and that’s not what I’ve ever ever done. I’ve always loved doing this and I’d kind of lost touch with that. So, I went back and listened to all the records that made me want to, first of all, pick up a guitar. And in fact, because I have a lot of vinyl stored away still, rather than easily available, I went out and bought the first five Black Sabbath records just because I remembered loving them when I was a kid. It also depressed me a bit because if I listen to them, having written songs, I would go, “Oh God, I know the formula they’re gonna follow here, they do the same thing all the time,” so that didn’t actually work to sort of spur me out of the writing depression. Most of it was just trying to get in touch with what inspired me in the first place. What other records did you listen to? I listened to a lot of old Dr. Feelgood albums. I started listening to a lot of the old reggae stuff I used to listen to. It was kind of fun to reestablish what I had been listening to back in the day. I even listened to a couple of our records because that’s not a thing that most people that are in bands do; you very rarely listen to your own stuff unless you’re going on tour and someone suggests a song you haven’t played in years and you have to sit and listen to it to try and remember what the heck the chords were. I was basically just listening to all the stuff I had been listening to in 1975 and 1976. I played the first Clash album a lot again and, if anything, that kind of backfired as well because I started writing songs that sounded like bloody Joe Strummer again. But, it was a fun thing to do. What kinds of topics are you taking on in the songs for this album? Well, I mean obviously I’ve never been any good at writing “I Love Her and She Loves Me” types of songs, and when we’ve been our most successful in the past, not just in terms of the actual quality of the songs, it’s been when are writing about things that offend my sense of justice, and there’s no shortage of those at the moment. There’s one song specifically dealing with the whole Bernie Madoff thing, and I’m not talking about the rich and famous that he ripped off but the everyday investor that sunk their money into those sort of things. There are songs about how you’re told from when you’re sort of knee-high to grasshopper that to get on in the world you want to study hard and you want to do well and get a good job and make sure you put your money safely in a bank and then of course that the bank collapse is not only engineered by those at the top, but those at the top (even if they do lose their jobs) lose their jobs with a big golden handshake and disappear off into the distance while you’re left wondering when you’re going to make your next rent payment. And we happened to be in Ireland at the time of all the child abuse in the Church scandals and I saw guys being interviewed. And you’ve got to realize what a patriarchal society Ireland is and the actual influence that the Church has on the country. So it was an incredibly brave thing for these men to come out and talk about this and they didn’t come out with their faces disguised or their voices disguised in any way; they actually stood in front of a camera and told their stories. And watching it on television and realizing that all of these things happened to these guys when they were like seven years old in the country that I was living in and they were about the same age that I was, so I was probably the same age as these people. And to think that that was going on was just bone-chilling. What has it been like having your original bassist [Ali McMordie] back in the band? It’s been great. It was kind of strange at first. He and I are the only two original members in the band and he seemed to get on great with the other two guys and they would socialize and everything, but with he and I… I wouldn’t say things were tense, but we were sort of overly polite to one another. It was kind of odd at first. But very quickly we got beyond that and were where we were years ago. It’s great having him there because he’s just brought such an amount of enthusiasm back to the project. Again, I think I was feeling a bit disillusioned with the whole thing and to suddenly have Ali’s enthusiasm and his energy, [having] that sort of injected back into the band energized everybody, really. And it was the same thing in the studio. The way we tend to record is we’ll do as much as possible in rehearsal so that we’ve got the songs as routine and as tight as we can get them, but when we’re actually in the studio it tends to be an individual thing. The drums get done first and then the bass and then guitar and then the vocals so you’re very rarely all in the studio together until it comes to mixing and a lot of the time, when we were actually mixing, I found myself going, “Hell, I didn’t know you could play that well!” So there was an element of surprise there, but at least they were all good surprises. You used Pledge Music to help fund your most recent record. What were your experiences with that? When we were talking about doing the album we still had a sort of rolling contract with EMI. We would kind of give them first refusal, but when we went out and spoke to labels, not even just EMI, none of them seemed in a particularly enthusiastic mind not just about us but even about their own futures. Since the internet kind of decimated record stores and what have you, they’re all a bit scrambling around trying to see what their role in the world is anymore and our management suggested that we go the Pledge Music route. And we were a bit nervous at first, because its a big ask of your audience; they’re buying a record in advance that they haven’t heard so basically you’re asking them to, “Trust me, you’re going to like this.” So we go, okay, it might be worth a go, and the more we thought about it we realize that if we do it this way we actually go back to where we were when we started– you become a truly independent act again. You’re not reliant on Chrysalis Records or on EMI or anybody like that. It is right back to when you made the first record. Suddenly we would be completely independent, and not that we had much interference in the past from these people, but there would be nobody coming down the road huffing and puffing behind our backs going, “You know, I don’t hear a single here, guys.” So that appealed to us. But, like I said, we were kind of nervous because it is a leap of faith on the audience’s part so we worked on the tightest budget we could make the thing on and set that as the target and launched the pledge appeal. We basically said we’d let the thing run for two months just to have as good a chance as possible of reaching this target and they reached it within 12 hours, which was just astonishing, and actually it goes beyond us just being flattered. I think we were all genuinely humbled by the faith the audience showed in us. But once you get past being flattered you start to think “Well, hell, I really hope they like it or we’ll pay for it!” and you’re aware of that when you’re in the studio. Overall, it’s been an incredibly positive experience and I’m sure we’ll do it again in the future. What would 1977 Stiff Little Fingers think of this record? I would hope they would like it. They might think that some of the playing was a bit flash, but that’s only because they couldn’t do it themselves then. The subject matter of the songs is something that they would definitely recognize and would empathize with. It’s certainly not a record we could have made in 1977. What do you see for the future of the band? Well, the immediate future is a lot of touring. I leave tomorrow to fly to New Zealand, so we’re touring New Zealand, Australia, Japan, the UK and Ireland right up until April. And we’ve got a couple festivals in the summer and hopefully a US tour in September and October, and then even more UK and European shows in November and the back end of the year. But it’s been such a positive experience and I remembered just how much fun you can have in a recording studio and obviously it’s hard work, but at the end of the day you come out with something you think is worthwhile. So, that’s rekindled my enthusiasm for writing again. Hopefully it won’t be ten years before we put out another record.